As promised here is the crafty little post on how to make 3D snowflakes, courtesy of my gorgeous daughter Emily. Sorry folks for the bad quality photos but the camera was playing up and the black cloth made it look very grainey but I think you'll get the idea just the same. This is what you will need to get started. We used cellotape and a stapler for the purpose of this demo as our glue gun had gone walkies but it's the best thing for this if you can lay your hands on one. A bit of sticky tape will do the trick though. For the purpose of this tutorial Emily has used regular A4 copy paper but you could use any fancy paper, gold, silver, double sided patterned paper, whatever takes your fancy. Ultimately you need to start with a square shape, which ours was not so Em's had to cut it down like this. We then ended up with a square of approx 8x8 inches which turned out to be a giant snowflake!!! We would suggest that 4x4 inches is a more suitable size or even smaller but then they become a bit more fiddly. The next step is to fold your square into a triangle shape, then fold again to make a smaller triangle like this. You then need to to cut lines along the' long' edge towards the seam, (hope that makes sense!) and depending on the size you're making will need to cut three or four times. You then open up your triangle and you should fingers crossed have something that resembles this. Here comes the artistic bit guys and gals! You need to pull together the first two inner strands of the snowflake and either cellotape or glue the two together. Once you have done that turn the snowflake over and repeat with the next two strands, turn it over again, glue them and repeat until you have linked them all and have one of these little beauties! When you've done your first three you need to link them together like this. Again a glue gun is best here but you can use tape (or a stapler if that's the only thing you can lay your hands on, and quite frankly once they're hanging from the ceiling you can't tell anyway!) Line up the three points together and apply a small dab of glue to each and stick. You're half way there you clever thing you! One last little thing. You will see that if you hold the star upright it will go all floppy so you also need to link the three separate flakes with a little glue to hold it all together and make it more sturdy. Do the same with your other three. You will then need to link them together to create your fully formed snowflake. This can be a bit tricky, especially when handling a giant one, but Em managed it. Phew! Tah Dah!!!!!! !We ended up with this utterly fab creation. Easy peasey, lemon squeezy! A rather large one but how pretty is that? The big one then had a little baby snowflake! These are so easy to make, cost hardly anything and create such an impact when you have all different sizes and colours hanging from the ceiling. The kiddlies could even decorate them with a bit of glittery stuff. Get your little angels making these, but be prepared to do the cutting and glueing, as remember only grown up people can use the stapler, scissors and hot glue! You can let them loose with the sticky tape. It's a fun, bonding (excuse the pun!) thing to do together. Now these I love and soooooo easy it's ridiculous. Buy yourself some baubles, plain, sparkly, shiney and matt to mix it up a little, and thread them on to some ribbon, the kind you tend to tie around your pressies will do the job. 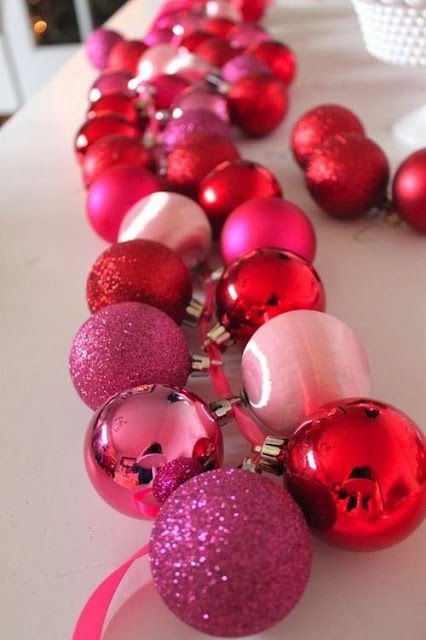 Put plenty on to make yourself a beautiful garland, remember to tie the ones on at the ends so you don't loose all your hard work on the floor! 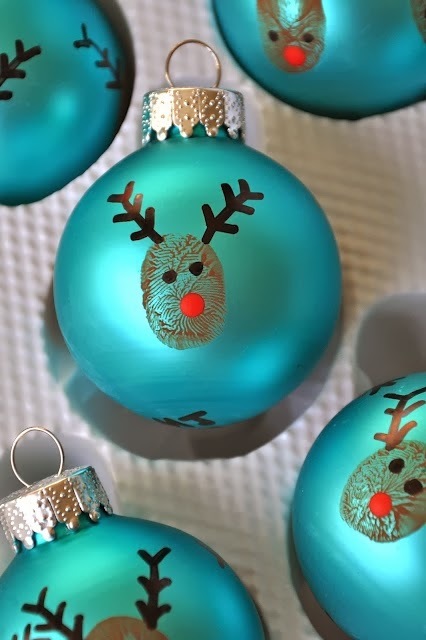 You can get tubs of baubles really cheaply these days, they don't have to be glass or fancy, plastic ones will look just as good and look impressive and expenisve when you've finished. 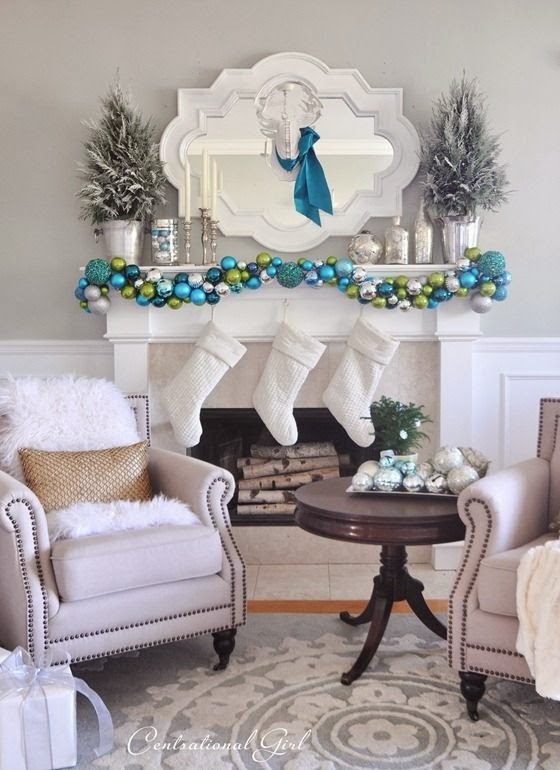 Yours WILL look like this too if you make a long garland for your fireplace but you can make any length you like. All you will need is a bauble, brown paint and felt pens. Wiggle your thumb into the paint and press the imprint on to your bauble. Let it dry so it doesn't smudge on the next bit. Grab your felts, add some antlers and eyes, then add a red nose. Hey presto Rudolph comes alive! These are gorgeous and you can make new ones each year as you're little ones are growing. Thanks for tuning in for mine and Emily's Blue Peter moment!